Nearly 590,000 roadway bridges span waterways, dryland depressions, other roads, and railroads throughout the United States. The most dramatic bridges use complex systems like arches, cables, or triangle-filled trusses to carry the roadway between majestic columns or towers. However, the work-horse of the highway bridge system is the relatively simple and inexpensive concrete beam bridge. Also known as a girder bridge, a beam bridge consists of a horizontal slab supported at each end. Because all of the weight of the slab (and any objects on the slab) is transferred vertically to the support columns, the columns can be less massive than supports for arch or suspension bridges, which transfer part of the weight horizontally. A simple beam bridge is generally used to span a distance of 250 ft (76.2 m) or less. Longer distances can be spanned by connecting a series of simple beam bridges into what is known as a continuous span. In fact, the world's longest bridge, the Lake Pontchartrain Causeway in Louisiana, is a pair of parallel, two-lane continuous span bridges almost 24 mi (38.4 km) long. The first of the two bridges was completed in 1956 and consists of more than 2,000 individual spans. The sister bridge (now carrying the north-bound traffic) was completed 13 years later; although it is 228 ft longer than the first bridge, it contains only 1,500 spans. A bridge has three main elements. First, the substructure (foundation) transfers the loaded weight of the bridge to the ground; it consists of components such as columns (also called piers) and abutments. An abutment is the connection between the end of the bridge and the earth; it provides support for the end sections of the bridge. Second, the superstructure of the bridge is the horizontal platform that spans the space between columns. Finally, the deck of the bridge is the traffic-carrying surface added to the superstructure. Prehistoric man began building bridges by imitating nature. Finding it useful to walk on a tree that had fallen across a stream, he started to place tree trunks or stone slabs where he wanted to cross streams. When he wanted to bridge a wider stream, he figured out how to pile stones in the water and lay beams of wood or stone between these columns and the bank. The first bridge to be documented was described by Herodotus in 484 B.C. It consisted of timbers supported by stone columns, and it had been built across the Euphrates River some 300 years earlier. allowed them to pour the concrete for the column base. Bridge building began the transition from art to science in 1717 when French engineer Hubert Gautier wrote a treatise on bridge building. In 1847, an American named Squire Whipple wrote A Work on Bridge Building, which contained the first analytical methods for calculating the stresses and strains in a bridge. "Consulting bridge engineering" was established as a specialty within civil engineering in the 1880s. Further advances in beam bridge construction would come primarily from improvements in building materials. Most highway beam bridges are built of concrete and steel. The Romans used concrete made of lime and pozzalana (a red, volcanic powder) in their bridges. This material set quickly, even under water, and it was strong and waterproof. During the Middle Ages in Europe, lime mortar was used instead, but it was water soluble. Today's popular Portland cement, a particular mixture of limestone and clay, was invented in 1824 by an English bricklayer named Joseph Aspdin, but it was not widely used as a foundation material until the early 1900s. Concrete has good strength to withstand compression (pressing force), but is not as strong under tension (pulling force). There were several attempts in Europe and the United States during the nineteenth century to strengthen concrete by embedding tension-resisting iron in it. A superior version was developed in France during the 1880s by Francois Hennebique, who used reinforcing bars made of steel. The first significant use of reinforced concrete in a bridge in the United States was in the Alvord Lake Bridge in San Francisco's Golden Gate Park; completed in 1889 and still in use today, it was built with reinforcing bars of twisted steel devised by designer Ernest L. Ransome. Prestressing can be applied to a concrete beam that is precast at a factory, brought to the construction site, and lifted into place by a crane; or it can be applied to cast-in-place concrete that is poured in the beam's final location. Tension can be applied to the steel wires or rods before the concrete is poured (pretensioning), or the concrete can be poured around tubes containing untensioned steel to which tension is applied after the concrete has hardened (postensioning). Each bridge must be designed individually before it is built. The designer must take into account a number of factors, including the local topography, water currents, river ice formation possibilities, wind patterns, earthquake potential, soil conditions, projected traffic volumes, esthetics, and cost limitations. A cutaway view of a typical concrete beam bridge. the forces that will act on each component of the completed bridge. Three types of loads contribute to these forces. Dead load refers to the weight of the bridge itself. Live load refers to the weight of the traffic the bridge will carry. Environmental load refers to other external forces such as wind, possible earthquake action, and potential traffic collisions with bridge supports. The analysis is carried out for the static (stationary) forces of the dead load and the dynamic (moving) forces of the live and environmental loads. Since the late 1960s, the value of redundancy in design has been widely accepted. This means that a bridge is designed so the failure of any one member will not cause an immediate collapse of the entire structure. This is accomplished by making other members strong enough to compensate for a damaged member. Because each bridge is uniquely designed for a specific site and function, the construction process also varies from one bridge to another. The process described below represents the major steps in constructing a fairly typical reinforced concrete bridge spanning a shallow river, with intermediate concrete column supports located in the river. Example sizes for many of the bridge components are included in the following description as an aid to visualization. Some have been taken from suppliers' brochures or industry standard specifications. Others are details of a freeway bridge that was built across the Rio Grande in Albuquerque, New Mexico, in 1993. The 1,245-ft long, 10-lane wide bridge is supported by 88 columns. It contains 11,456 cubic yards of concrete in the structure and an additional 8,000 cubic yards in the pavement. It also contains 6.2 million pounds of reinforcing steel. 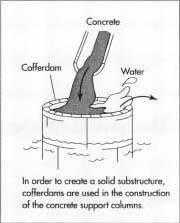 1 A cofferdam is constructed around each column location in the riverbed, and the water is pumped from inside the enclosure. One method of setting the foundation is to drill shafts through the riverbed, down to bedrock. As an auger brings soil up from the shaft, a clay slurry is pumped into the hole to replace the soil and keep the shaft from collapsing. When the proper depth is reached (e.g., about 80 ft or 24.4 m), a cylindrical cage of reinforcing steel (rebar) is lowered into the slurry-filled shaft (e.g., 72 in or 2 m in diameter). Concrete is pumped to the bottom of the shaft. As the shaft fills with concrete, the slurry is forced out of the top of the shaft, where it is collected and cleaned so it can be reused. The aboveground portion of each column can either be formed and cast in place, or be precast and lifted into place and attached to the foundation. 2 Bridge abutments are prepared on the riverbank where the bridge end will rest. A concrete backwall is formed and poured between the top of the bank and the riverbed; this is a retaining wall for the soil beyond the end of the bridge. A ledge (seat) for the bridge end to rest on is formed in the top of the backwall. Wingwalls may also be needed, extending outward from the back-wall along the riverbank to retain fill dirt for the bridge approaches. 3 In this example, the bridge will rest on a pair of columns at each support point. The substructure is completed by placing a cap (a reinforced concrete beam) perpendicular to the direction of the bridge, reaching from the top of one column to the top of its partner. In other designs, the bridge might rest on different support configurations such as a bridge-wide rectangular pier or a single, T-shaped column. 4 A crane is used to set steel or prestressed concrete girders between consecutive sets of columns throughout the length of the bridge. The girders are bolted to the column caps. For the Albuquerque freeway bridge, each girder is 6 ft (1.8 m) tall and up to 130 ft (40 m) long, weighing as much as 54 tons. 5 Steel panels or precast concrete slabs are laid across the girders to form a solid platform, completing the bridge superstructure. One manufacturer offers a 4.5 in (11.43 cm) deep corrugated panel of heavy (7-or 9-gauge) steel, for example. Another alternative is a stay-in-place steel form for the concrete deck that will be poured later. 6 A moisture barrier is placed atop the superstructure platform. Hot-applied polymer-modified asphalt might be used, for example. 7 A grid of reinforcing steel bars is constructed atop the moisture barrier; this grid will subsequently be encased in a concrete slab. 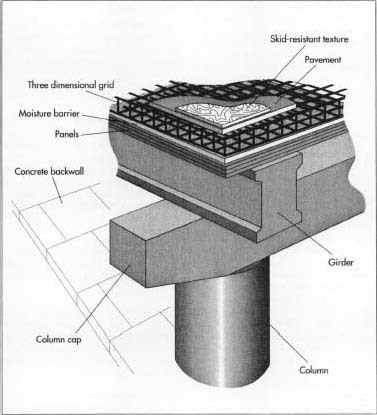 The grid is three-dimensional, with a layer of rebar near the bottom of the slab and another near the top. 8 Concrete pavement is poured. A thickness of 8-12 in (20.32-30.5 cm) of concrete pavement is appropriate for a highway. If stay-in-place forms were used as the superstructure platform, concrete is poured into them. If forms were not used, the concrete can be applied with a slipform paving machine that spreads, consolidates, and smooths the concrete in one continuous operation. In either case, a skid-resistant texture is placed on the fresh concrete slab by manually or mechanically scoring the surface with a brush or rough material like burlap. Lateral joints are provided approximately every 15 ft (5 m) to discourage cracking of the pavement; these are either added to the forms before pouring concrete or cut after a slipformed slab has hardened. A flexible sealant is used to seal the joint. The design and construction of a bridge must meet standards developed by several agencies including the American Association of State Highway and Transportation Officials, the American Society for Testing and Materials, and the American Concrete Institute. Various materials (e.g., concrete batches) and structural components (e.g., beams and connections) are tested as construction proceeds. As a further example, on the Albuquerque bridge project, static and dynamic strength tests were conducted on a sample column foundation that was constructed at the site, and on two of the production shafts. Numerous government agencies and industry associations sponsor and conduct research to improve materials and construction techniques. A major goal is the development of lighter, stronger, more durable materials such as reformulated, high-performance concrete; fiber-reinforced, polymer composite materials to replace concrete for some components; epoxy coatings and electro-chemical protection systems to prevent corrosion of steel rebar; alternative synthetic reinforcing fibers; and faster, more accurate testing techniques. Hardesty, E. R., H. W. Fischer, R. W. Christie, and B. Haber. "Bridge." In McGraw-Hill Encyclopedia of Science & Technology. New York: McGraw-Hill Book Company, 1987, pp. 49-58. Troitsky, M.S. Planning and Design of Bridges. New York: John Wiley & Sons, Inc., 1994. "General Information About Concrete Pavement." American Concrete Pavement Association. http://www.pavement.com/general/conc-info.html (24 Feb. 1998). "Beam Bridge." Nova Online "Super Bridge." November 1997. http://www.pbs.org/wghb/nova/bridge/meetbeam.html (24 Feb. 1998).